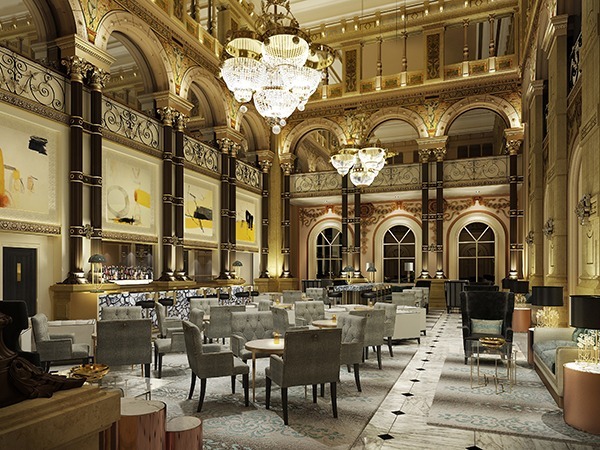 Richmond International has been commissioned to design Hilton Paris Opera, formerly Grand Hotel Terminus, one of Paris’ original majestic hotels. 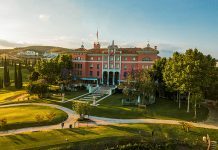 Designed by architect Juste Lisch, the hotel first welcomed visitors to the Exposition Universelle of 1889. The hotel will soon rebrand as part of a major renovation and open its doors as Hilton Paris Opera. The central archways of the entrance lobby open up to the heart of the hotel, the highly decorative Le Grand Salon. 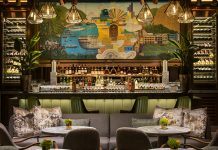 The formality of the original architecture, with a 14m high ceiling and hand-painted murals, has been updated with the addition of a large brass and backlit glass feature bar, high tables and mix of contemporary and vintage furniture. The space’s architectural detailing is echoed in the bespoke handcrafted wool rugs, sofas and coloured glass tabletops, all of which have been designed to create a fresh and sophisticated interior. The raised ground floor entrance lobby lies behind a large revolving glass door with stone floors, elegant Corinthian-style columns and an intricately hand-painted ceiling from the original building. Crystal chandeliers, inspired by jewellery pieces, suspend from the ceiling whilst curved chairs and glass cocktail tables offer guests intimate seating areas. Two reception desks are positioned either side of a raised rear area and feature floral panel designs crafted from brass; these reflect the original brass detailing that adorns the central balustrade. Highlights include Salon Baccarat, the hotel’s largest meeting room, a glamorous function space lit by five Baccarat crystal chandeliers. Six additional newly refurbished meeting rooms are located on the Entresol level of the hotel and offer audio-visual technology. The Breakfast Lounge occupies the Mezzanine level, which it shares with the hotel’s executive lounge, with spaces that wrap and flow around the corner of the building. 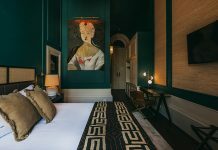 An ornate grand staircase leads to the luxurious guestrooms where commissioned artworks decorate the corridor walls outside. A muted colour scheme with dashes of delicate brass detailing gives each room a sense of tranquility whilst enriching the guest experience.